This will certainly change the face -- and body -- of fashion in Paris, but it won't be the first time a non-anorexic or even non-skinny model struts the catwalk for Gaultier in Paris fashion week. My friend, Velvet d'Amour, has already broken that barrier. So, instead, she became the first plus-sized model to walk the regular Paris fashion week runway, first in 2005 for John Galiano, then in 2006 for Jean-Paul Gaultier, after he cast her partly in reaction to the death of Brazilian model Ana Carolina Reston from anorexia. Since then, she's gone on to do films, ads (on both sides of the camera), and Italian Vogue named her one of the top 10 plus-sized models in the world. Velvet says she got the last laugh: She was the only model who got to keep her Gaultier outfit, because it had to be made to her size and couldn't be re-used by anybody else. She's got a great sense of humor and self-confidence, and is extremely creative: model, actress, photographer, and publisher/Editor-in-Chief of a magazine called VolUp2 which celebrates women of all sizes. Despite the new law, and Velvet's success, it would be naïve -- and flat out incorrect -- to say that plus-sized is the standard for beauty here in France. 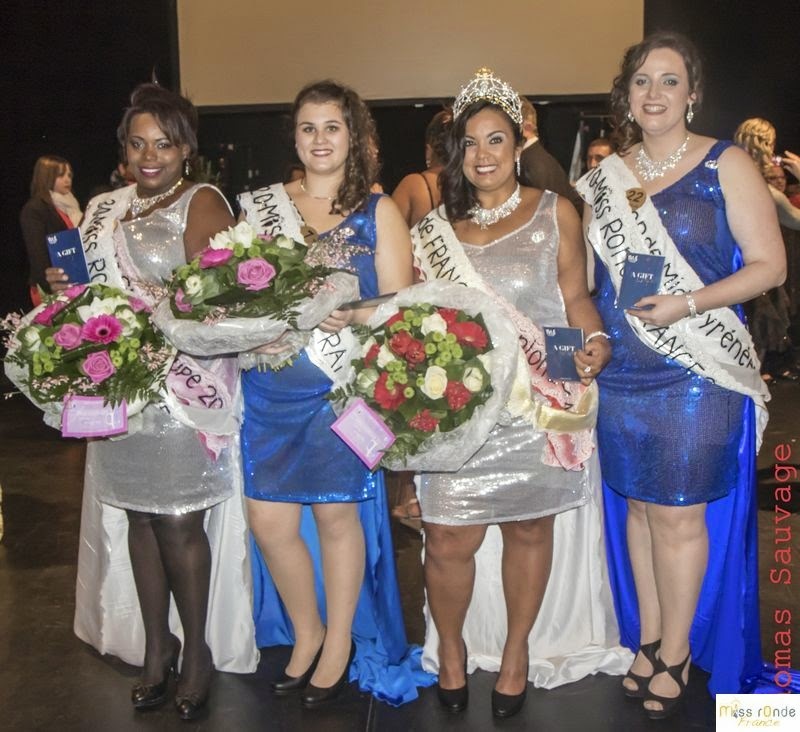 But there is a small annual beauty pageant for large women, called Miss Ronde. On the other end of the spectrum, an estimated 40,000 people in France (90% of them women) are anorexic, so lawmakers feel they've had enough with the super skinny standard used for modeling. It seems like this law would be a hard one to pass in the US, because somebody would cry "discrimination" based on weight, but, as the mother of two girls, I rather like the intent and purpose of the proposed law. Gigi is looking over my shoulder at these photos of Velvet and the Miss Ronde contestants and says, "They're beautiful!" I'm glad she sees it, and now we just need to work on getting the rest of society to stop glamorizing skeletal figures. Rond de Sansac is a raw goat's milk cheese from the Domaine de Sansac, in Charente, the home to so many great goat cheeses. This one come wrapped in a leaf, which doesn't do anything for the flavor, but it's supposed to look pretty. Apparently, I don't find the label or leaf that pretty and photograph it without, as you can tell by the marks left behind. It's a simply, thick, creamy, thirst-inducing cheese with both a delicate flavor and gently velvety crust. Beyond any hints of goat or herbs, what mostly comes through is the unadulterated taste of milk. It's milk turned into a solid, which makes it less interesting to eat plain but -- as always -- ridiculously delicious when drizzled with fancy honey. Not only is the cheese velvety and fuzzy, in honor of Velvet d'Amour, it's also named rond, like the Miss Ronde pageant. Will classically thin models on the catwalks and pages of French fashion suddenly be able to eat this cheese, thanks to the new law? Probably only a bite every month, but I suppose that's better than what they've been used to, which is none, ever. Both Velvet d'Amour and I can indulge ourselves more frequently than that -- thank heavens.